I am so excited to show this baby off. 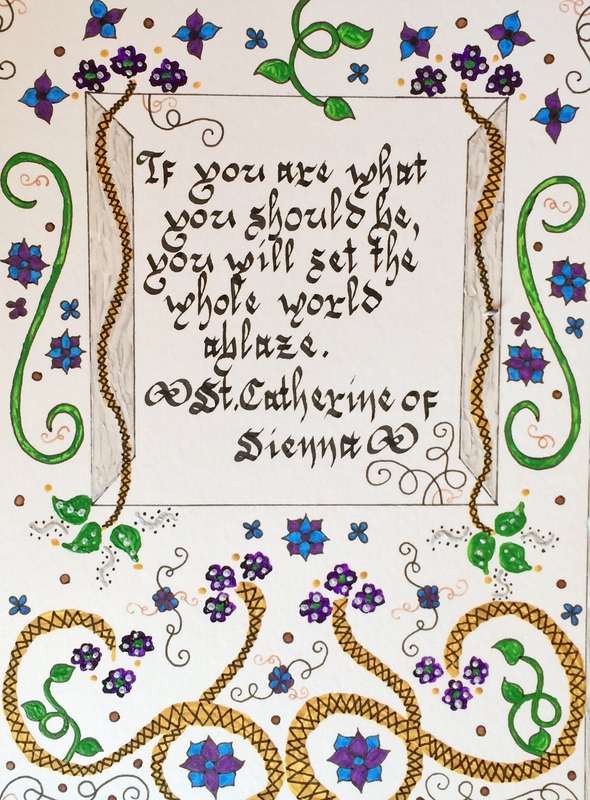 I love this quote by St. Catherine of Sienna and I’ve been scribbling it on everything. 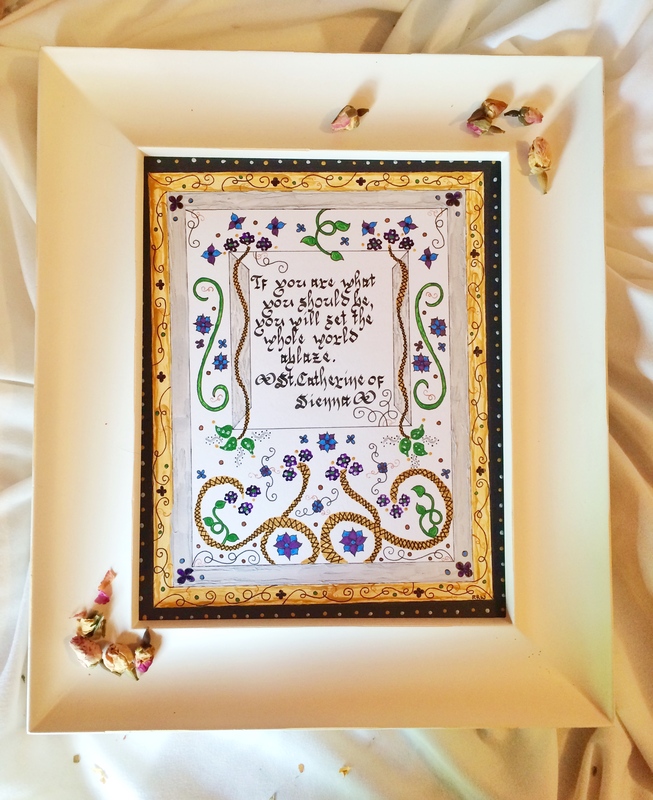 A close look at the calligraphy. The Batarde font is really the one I excel at. I decided to make this a mixed media dealio. Himself tells me I’m nuts for thinking this but when I think of fine art I don’t include sharpie art and that’s what I’ve been using for my most recent illuminations. So this time I decided to mix in some acrylics, because, you know, that’s a serious medium. I have zero training with acrylics but I like the unevenness and texture. And it turns out I can ink over it with Micron pens so happy days! 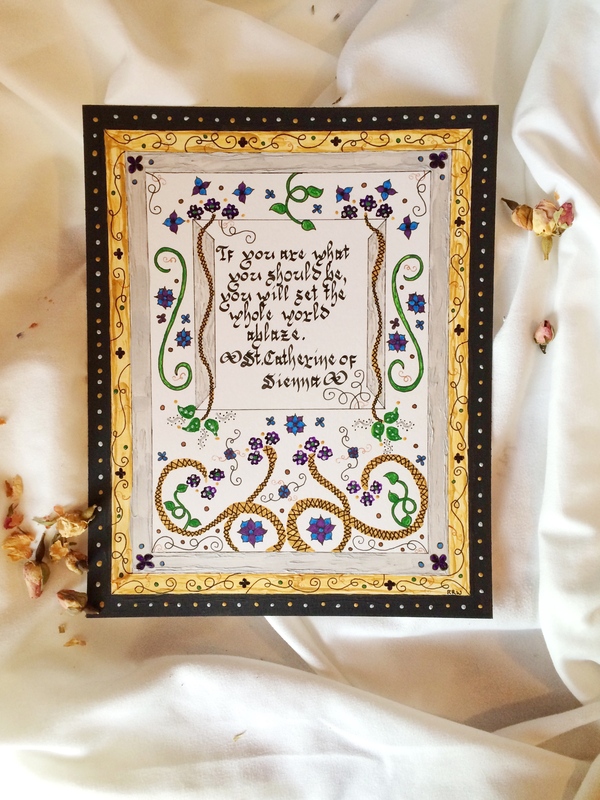 I did find, though, that I prefer to draw my designs with ink and then paint it in. I’m guessing that might change once I’ve gotten more experience with the various paint mediums but then again maybe not, I do like my black outlines. And in a frame. I actually purchased these frames for some photos my brother gave me but I’ve re-purposed them and now they exclusively show off my art. I had a hard time determining when this one was done. I wanted some white space so I wasn’t trying to fill everything in (this time, anyway). I even pulled it out of its protective sleeve again Tuesday to see if I wanted to add anything. I decided against messing with it; if it was done a few days ago it’s done now. So this one is in my etsy shop. I debated whether or not to feature it over here in The Wordsremember Shop but I think it’ll get more traffic over there (or maybe not, SEO isn’t fun for me, I’m constantly tinkering with it). If you’ve visited my shop you might’ve noticed a price difference; I talked about how hard it is to price art in this post and I’m still struggling with the issue. I’ve got some of my first pieces still up and, while I still think they’re good enough, I don’t want to price them as high as the stuff I’ve been doing recently that I feel can command a more sustainable price. And by sustainable I mean I’m actually paying myself an hourly wage. So I’ve set prices in the middle and as I add newer pieces the price differences will disappear. Bah I don’t like pricing stuff. I used the paintbrushes I had lying around; if I stumble across one I really like I’ll link it later.